The good news is that there is hope—believable hope, hope that is not a mere pipe dream, but actually leads to positive change. Thousands of women and men are leading active, joyful lives, free from the constraints of their formerly life-controlling behaviors. How did it happen? I'm not naively, pompously, or piously pontificating about 'other people's problems.' I've experienced many of these life-controlling issues as well. I empathize with you. I know how it feels to be addicted or overweight. But I'm not chained to my past anymore, and that's what gives me the confidence to encourage you—that you, too, can be free. I don't want to toot my own horn—well, maybe just a little—but it is important that you understand why I am so confident that my approach to overcoming your life challenges will work for you. By changing my mindset, I have not only been able to overcome my addictions, I have become emotionally healthy and happy as well. Once free of my own compulsive behavior, I opened a halfway house for drug- and alcohol-addicted mentally ill victims in one of the most drug-infested neighborhoods in Nashville. At twenty-seven years of age, I established Foundations Associates, and the first of several residential drug and alcohol treatment centers, through which I have helped thousands of other people plagued by compulsive behavior. I pioneered centers in various locations across the United States to address the needs of everyday people as well as high-end, celebrity-type, and executive clients. Today, as chairman of the board of American Addiction Centers, a leader in the addiction treatment community, I have renovated and reopened The Greenhouse, a luxurious, 'classic' spa property in Dallas, as well as the Desert Hope Center in Las Vegas. Additionally, I developed Fit-RX, a residential weight-loss facility and program located in Nashville. To date, thousands of people have completed rehabilitative programs at our treatment centers. Another 20,000 people contact our companies each month seeking information or help in dealing with some life-controlling issue. Now, with more than twenty years of experience in dealing with addictive behavior in both 'down and outers' and 'up and outers,' I am considered a premier addiction specialist. With my emphasis on dual diagnosis—treating addictive behavior along with the accompanying mental/emotional issues—our success rate has been so impressive that I was invited to testify before the U.S. Senate as an expert on substance abuse and mental health matters. ©2012 Michael Cartwright, MA and Ken Abraham. All rights reserved. Reprinted from Believable Hope. No part of this publication may be reproduced, stored in a retrieval system or transmitted in any form or by any means, without the written permission of the publisher. Publisher: Health Communications, Inc., 3201 SW 15th Street, Deerfield Beach, FL 33442. Michael Cartwright is a respected addiction industry trailblazer and a noted behavioral healthcare entrepreneur. Over his seventeen-year career, Michael has been instrumental in setting up addiction treatment centers across the United States which have served over 20,000 patients. 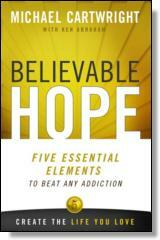 He has been committed to research-based treatment and has directly supervised fifteen federally funded studies that helped lay the foundation for the 5 Elements to overcome any addiction. A leading advocate for dual diagnosis treatment, Michael was nominated by Senator Ted Kennedy to the Senate Health Committee. Michael was a founding board member for the 12-Step organization Dual Recovery Anonymous, a national support group helping people suffering from combined mental health and substance abuse issues. He is the founder and Chairman of American Addiction Centers, a behavioral healthcare company with treatment centers in California, Texas, Nevada, and Tennessee.